Reviews can make or break a product or service. Think about it: when was the last time you decided to try a new restaurant without first checking reviews and ratings on a site like TripAdvisor or Yelp? The truth is, people tend to rely on reviews from other like-minded customers to get a good idea of the product or service before trying it out. It’s the same on Drivy. Reviews from our users are a crucial factor for those looking to rent a vehicle from another local. So how do you make sure you’ll always get 5-star reviews? When it comes to your listing, details matter. In fact, the more information you provide, the better. Provide a clear and accurate description of your vehicle so drivers are reassured that they know exactly what they’ll be getting. Don’t forget to include great photos of your vehicle, too - listings with great pictures are 3 times more likely to get booked than those with subpar photos. Good communication with the owner is often mentioned as a reason why drivers leave 5-star reviews. Make sure to provide the driver with all the information they need for a successful trip, and stay in contact when you can. Once you’ve accepted a trip and a driver has booked your car, send them a message via the Drivy app or website to thank them for choosing your car. You should also provide any additional information they might need; for example, if you have a locked gate that they’ll need a code for in order to access your car. At check-in for non-Drivy Open trips, go through everything with the driver step by step to ensure they are comfortable with how everything works. Spending that extra 5 minutes at the beginning of a trip can save a lot of time and grief for both of you later on. Keep your interactions friendly so that renters feel at ease during their trip. When owners go above and beyond to satisfy their drivers, it’s more likely they’ll get a great review in exchange. Think about the little extras that you would appreciate if you were hiring a car. Maybe it’s those essential items that a driver might have forgotten to pack, like tissues, wet wipes, a phone charger, or an auxiliary cable. Or it could be thoughtful touches such as a bottle of water, snacks for the road, or a blanket during chilly winter months. They don’t have to cost much, but adding those special touches to make a driver’s journey more comfortable can make all the difference. Every driver will appreciate stepping into a car that’s freshly cleaned inside and out. We know personal schedules can be demanding, but it’s worth taking the time to give your car some tender loving care - especially when you’ve already had a few rentals. We recommend doing a quick clean after every 3 rentals or one long rental, and going to a carwash at least every few weeks. Pro tip: To make it easier to keep the inside of your car clean, stash a handheld car vacuum in the trunk. Also, keep some air fresheners handy to quickly and easily add a pleasant scent to the inside of your car. We know keeping a car clean is easier said than done. That’s why we’ve recently partnered with WashDoctors, the on-demand car washing service that comes straight to you. Watch this space for exclusive deals for our Drivy owners. For hassle-free car maintenance, we’ve also linked up with Fixter. From general car check-ups to MOTs, Fixter will pick up and drop off your car, making the whole process that much easier. Use our special discount with Fixter to get your MOT for just £19 here. Our community is at the heart of what makes Drivy work. Without our owners, we wouldn’t have the amazing mix of vehicles on the platform for drivers to book. Commitment is key when it comes to maintaining a 5-star listing. Keep your availability calendar updated, add new useful information to your description when necessary, and avoid cancelling a booking. If you can’t commit to the agreed check-out time, for example, let the driver know as early as possible to avoid any potential hiccups. Also, don’t forget to monitor your reviews and take the feedback seriously. 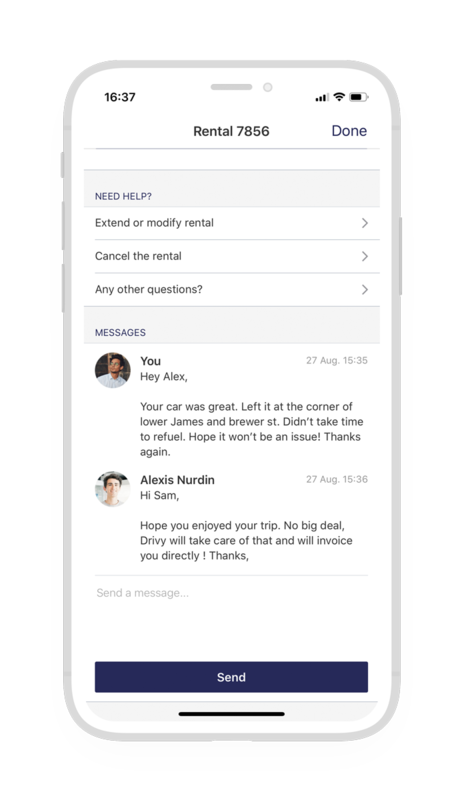 Use every review to learn how to make the trip experience the best it can be, encouraging even more drivers to book your car in the future.